Dr. Matthew Threadgate is the only urologist in the Illawarra offering this treatment. For all enquiries please call 1300 247 008. Using Convective WAVE® Technology, Rezūm is a safe, effective1 and modern method for the treatment of BPH. Each 9 second treatment uses 0.42ml of radiofrequency heated sterile water vapor, which rapidly and uniformly disperses through the tissue interstices. The condensation of water vapor releases stored thermal energy. Cell membranes are gently denatured, thereby causing immediate cell death, the vasculature is closed, and there is denervation of the alpha adrenergic nerves within the treatment zone providing you with an efficient, uniform predictable treatment. Post-operatively, this ablated tissue is resorbed by the body’s natural healing response, reducing the volume of tissue, allowing the prostatic urethra to open and relieving LUTS. 1. McVary KT, Roehrborn CG. Three-year outcomes of the prospective, randomized controlled Rezūm system study: Convective radiofrequency thermal therapy for treatment of lower urinary tract symptoms due to benign prostatic hyperplasia. Urology. 2018 Jan;111:1-9. 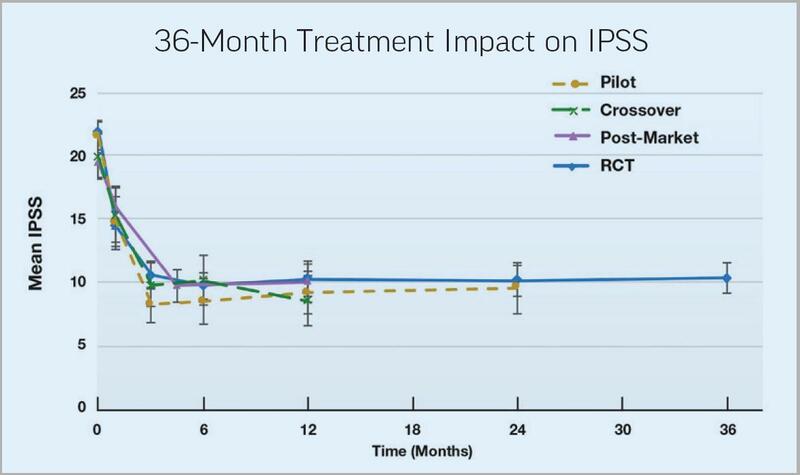 IPSS outcomes are consistent and durable across all studies. How does the Rezūm System work? What type of patients may benefit from the Rezūm procedure to treat BPH? How do I know if Rezūm water vapor therapy is a good treatment option for me? Your urologist will consult with you to determine if Rezūm water vapor therapy is a good treatment option for you based on your symptoms and personal treatment goals. The Rezūm System is indicated for men 50 years and older with a prostate volume of ≥ 30cm3 and ≤80cm3. The Rezūm System is also indicated for treatment of prostate with hyperplasia of the central zone and/or a median lobe. The use of the Rezūm System is contraindicated for patients with a urinary implant or who have a penile prosthesis. Do I have to go to the hospital for the Rezūm procedure? Shellharbour Private Hospital is the only provider of Rezūm in the Illawarra region. The Rezūm procedure can be performed under oral sedation or local anesthesia (prostate block) and doesn’t require general anesthesia. Your urologist will discuss pain management options with you to manage your comfort during the procedure. What are the potential side effects with Rezūm water vapor therapy? What are some of the short-term side effects that may occur with Rezūm? Rezūm has been proven to reduce urinary symptoms for many men who have been diagnosed with an enlarged prostate, or benign prostatic hyperplasia (BPH). Can Rezūm cause (new) erectile dysfunction? In the pivotal study, there were no reports of erectile dysfunction as a result of Rezūm. Can Rezūm cause ejaculatory dysfunction? Based on our pivotal study, ejaculatory function was preserved; however, men with BPH are at higher risk for other potential urinary/ejaculatory challenges and there is a possibility that Rezūm may uncover an underlying condition. Consult with your urologist about your individual clinical situation. Can Rezūm cause urinary incontinence? In the pivotal study, there were no reports of urinary incontinence as a result of Rezūm. Will my insurance cover the Rezūm procedure? Medicare and most private payers consider this procedure as a medical necessity. Talk to your urologist for more information.